Unfortunately, businesses are not immune to the difficulties of water damage. Of course, the first thing you should do when your business or the business you work at experiences water damage is to call a local professional water damage restoration company to help return the business back to its state before the damage struck. If you live in or near North Charleston, contact Clean Masters Disaster Restoration Services. However, in the meantime, while a restoration company is addressing the water damage, it may be challenging to come up with alternative business procedures while your business or the business you work is inconvenienced by undesired water. As a result of business water damage and the restoration process, some workers may be displaced from their regular work areas and some areas of your business may be rendered temporarily unusable. 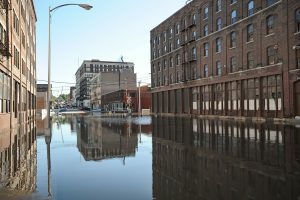 In the event of flooding to your business, there isn’t an alternative solution to every inconvenience that comes up, but there are a few ways to get around some of the common inconveniences to your business. By implementing some of these solutions, your business will be able to minimize the loss of productivity to the highest extent possible during the restoration process. The first thing you should do is make sure employees are aware of the situation. Contact them and explain that your business is experiencing water damage and cleanup and restoration processes are underway. Make sure to inform them which areas were damaged and ask them to stay out of the way of water restoration professionals. It is a good idea to put up signs near the damaged areas as a reminder. This will help your local restoration company be able to work as fast and accurately as possible so that your business can be back to its original state as soon as possible. The workspace of some of your employees has likely been compromised by the influx of water. If some of your employees’ workspaces have not been compromised, ask them to share their office with one of the displaced employees temporarily. You can use common areas like cafeterias, lounges, or meeting rooms if they have not been harmed to set up desktop computers, laptops, or any other office equipment that your displaced employees may need while the restoration process is still underway. Another option for employees who have to find alternative ways to work when their workspace is impaired by water is to work remotely. Working remotely is a good option for employees who already do a lot of their work on the computer, online, or on the phone. Working remotely is also a good option when all or almost all of your business space has been compromised by unwanted water. Ask an IT professional at your workplace to assist you in making working remotely a possibility for employees. Hopefully some of these suggestions for allowing business to continue as normal when your business is hit by water damage help. Remember to contact a professional water restoration company to help with the cleanup processes if your business has water damage. Contact Clean Masters if you live in North Charleston.